Excuse me for heretofore ignoring the biggest news to hit dive-bardom and 24-hour eats: the sale and subsequent revitalization of Seattle’s 80-year-old 5 Point Cafe. 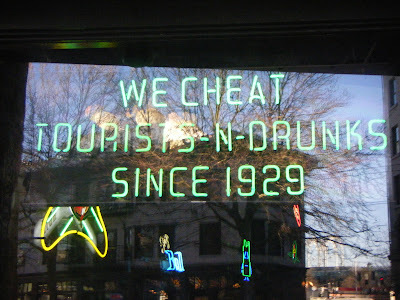 When rumors of the potential closure of Belltown’s oldest bar went swirling in September, fans steadied themselves for the shock of having one less legendary watering-hole to cry in their beer and one less 24-hour joint to soak up their sins with chicken-fried steak. But it’s been up-periscope since. “Alcoholics Serving Alcoholics since 1929,” as the bartenders T-shirts advertise. New owners David Meinert and Mandy Park took over last month, promising to keep the infamous periscope in the men’s room (offering a view of the Space Needle), updating the menu (they’ve brought back liver and onions and added the curry tofu scramble vegetarians loved at Capitol Hill’s late Green Cat Cafe), serving bottomless cups of Caffe Vita coffee and launching a senior citizens discount. Storefront come-on at the 5 Point. But first this gesture of generosity: On December 8, Meinert (a local concert promoter and events producer) and Park (who met her main-man Meinert at the cafe, where she’s worked since 1996) will be toasting the past by rolling back prices to their 1929 equivalent. So mark your calenders and stop in from noon to midnight next Tuesday for bacon and eggs downed with a Pabst Blue Ribbon (25 cents each for the b’fast and the brew), a burger with fries (two thin dimes) or a 30-cent Blue Plate Special. Got 5 Point stories? I’d love to hear them.